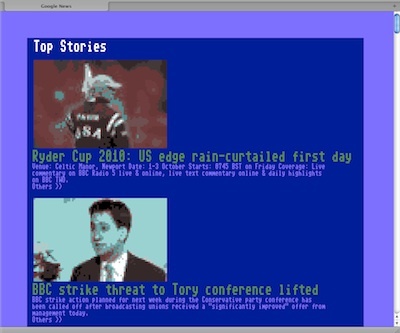 I made a silly Safari extension to rewrite Google News in an 8-bit style. Despite being a bit silly, this project had a real purpose, which was to make the Google News page less cluttered. Most of the extension is about removing things. Google News adds a lot of unnecessary information to the news page -- the only non-news part preserved by 8bitnews is the link to other articles, because this ability to see multiple interpretations of the same story is the best part about Google News. There are two other parts to the extension. The first other part adds a custom font. This wasn't hard at all -- extensions can bundle resources and reference them -- but many C64 fonts didn't actually display in Safari for some reason, even though I could preview them with Font Book. I eventually managed to find a reasonably-licensed font that worked. The final part of the project is the image manipulation. 8bitnews redisplays each image at 4x scale using a Commodore 64 palette. To convert to the C64 palette, I copied the image to a Canvas object, then accessed the image data from there to choose to most appropriate colour. To choose the best colour, each pixel is converted to the HSL colour space. This is important because variations in saturation and luminance are far less visually annoying than variations in hue. The pictures mostly look pretty bad, but sometimes there are some gems.